Model # T069.417.47.051.00. Swiss Army. - Three Chronograph Sub-dial. - Titanium Case. What is the difference between a water-resistant watch and a waterproof watch?. Included with each order is a certificate of authenticity. (This Rolex is inSUPER EXCELLENT CONDITION. Model No. 1601. This includes changes to the band. A new Datejust will even be heavier than the 1980's model. There have been many changes to the Datejust over the years, with the biggest changes happening mid 2000's). This bezel is in excellent condition without any dings or dents on it. Jewelry For Less Group is in no way affiliated with ROLEX nor do we claim to be. Product Details. Watch Accessories. Certain conditions apply, read below for details. ROLEX 16233 “CHAMPAGNE WITH 10 DIAMONDS” WARRANTY CERTIFICATE PAPER. Dial:Rolex Blue Vignette Dial. Don't miss out on your chance to own a piece of Rolex history! The owner of this watch is certain to set themselves apart from the crowd with their contemporary, yet refined taste, and elegance. Red Rolex Datejust Box With Manual. Condition is used and has some light wear as seen on picture. Sold as is. Incredibly well cared for Rolex 2 tone S.S &18K gold Jubilee 16013. Case: Stainless steel w/ 18k yellow gold fluted bezel (36mm). Manufacturer: Rolex. 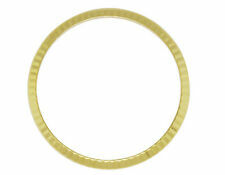 Bracelet: Stainless steel and 18k yellow gold Jubilee w/ Fliplock clasp. Case material Stainless steel. WATCH INFORMATION Band Material Stainless steel. Case: Stainless ste el. Bezel material Stainless steel. Band Color Silver. Band length 6 3/4 in (approx). Warranty: tissot warranty and manual. box: original tissot. crystal: Sapphire Crystal. case: Stainless Steel Rose Gold PVD. model number: T063.610.36.037.00. This product is new, original and 100% authentic so you get. Rolex 16263 Datejust Thunderbird Turnograph Watch 18k Two Tone w/ PAPERS! Rolex Datejust Turnograph Thunderbird Watch. Reference Number 16263. Two Tone - 18k Yellow Gold & Stainless Steel. 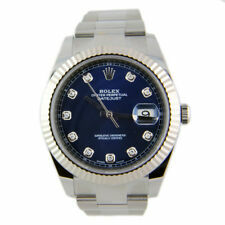 This watch is 100% Genuine Pre-Owned Rolex Model with Custom Diamond Bezel. This is a 100% Genuine Rolex Stainless Steel Oyster Perpetual Datejust watch with 2 carats of genuine diamonds added to the bezel. 4.5 out of 5 stars - Mens Rolex 36mm DateJust Diamond Watch Oyster Steel Band Custom Black Dial 2 CT.
4 product ratings4 product ratings - Mens Rolex 36mm DateJust Diamond Watch Oyster Steel Band Custom Black Dial 2 CT.
Model number 178240. Stainless Steel with Rhodium Floral Dial. Oyster Bracelet. Custom diamond band. Oversized Diamond Bezel.All Diamonds are VS Quality and F Color. Unworn watch. Model Number: 178240. Model number 178240. Ladies Midsize Stainless Steel. Rhodium Flower Floral Arabic Dial. Year 2016, Perfect. Model Number: 178240. Model: Datejust. Gender: Ladies Midsize. Vendor: Rolex. Give your watch a whole new look with this dial. You will love it! Notice how the two pictures look so different. Just small and simple differences in lighting and angle make big differences in the way it looks. Titanium case, crown & chronograph hands. Chronograph function with 3 sub-dials. 20 mm wide Titanium bracelet. instruction manual and box. Calendar date window at 4 o'clock. Black dial, white hands & markers. Custom White Mother of Pearl Diamond Dial, normally on a 116244 model. Rolex 36mm Datejust Stainless Steel Model 116200. Model Number: 116200. I know it sounds confusing, but it's not. It's simple. Model Number 178240. Midsize Ladies Stainless Steel. Custom Oversized Diamond Bezel for an 18K White Gold Pearlmaster President Model 81339 or 80299. Custom diamond band.All Diamonds are VS Quality and F Color. Give your watch a whole new look with this dial. You will love it! As with all my custom dials, the quality matches the quality of a factory Rolex dial because it is an actual factory Rolex dial that is simply refinished with diamonds added custom. Rolex 28mm Datejust Model Number 279173. • Model Number: 279173. • Model: Datejust. Nice size for a ladies watch. The two-tone is great because it's versatile and you can wear it with yellow gold or silver or white gold jewelry and it works both ways! ". Model Number: 116200. I know it sounds confusing, but it's not. It's simple. Model: Datejust. Vendor: Rolex. Case Material: Stainless Steel, Rolex uses 904L stainless steel superalloy for it's maximum resistance to corrosion and it is highly polishable. The T-Classic Dream wristwatch by Tissot has a sleek and classic design. This men's watch is constructed of stainless steel and yellow gold PVD coating.Case: Two-tone stainless steelCaseback: Snap-downBezel: Yellow gold PVD coated stainless steelDial: BlackHands: GoldtoneMarkers: Goldtone RomanCalendar: Date at 3Bracelet: Stainless steel and yellow gold PVD coatingClasp: DeploymentCrystal: SapphireCrown: Push/pullMovement: Swiss quartzWater resistance: 3 ATM/30 meters/99 feetCase measurements: 38 mm wide x 38 mm long x 7 mm highBracelet measurements: 18 mm wide x 7 inches long Box measurements: 4.5 inches wide x 3.5 inches long x 6.75 inches highModel: T0334102205301All measurements are approximate and may vary slightly from the listed dimensions.Men's watch bands can be sized to fit. Give your watch a whole new look with this dial. You will love it! This is my absolute favorite diamond dial right now. As with all my custom dials, the quality matches the quality of a factory Rolex dial because it is an actual factory Rolex dial that is simply refinished with diamonds added custom. Of diamondsThe diamonds are beautiful and white. Clarity: SI - VS Color: F-G. 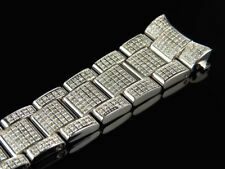 It really goes with just about anything and why not wear it with your diamond bezel Rolex?. With Custom Oversized 1 ct. Diamond Bezel that is custom made for this model but more designed for a 279383 model. It is cleanable. This is such a great deal! This is a huge savings! Even though this bezel is made custom to fit this watch exactly, the currently model number of the modern version of this watch with this diamond bezel as the factory one, is a 279383. Rolex 28mm Datejust Model Number 279173. Model Number: 279173. Model: Datejust. Nice size for a ladies watch. The two-tone is great because it's versatile and you can wear it with yellow gold or silver or white gold jewelry and it works both ways! ". Titanium case with a black rubber strap. Fixed titanium bezel. Black dial with skeleton hands and index hour markers. Minute markers around the outer rim. Dial Type: Analog. Luminescent hands and markers. Date display at the 3 o'clock position. Two sub-dials displaying: seconds and 24 hours (GMT). Quartz movement. Scratch resistant sapphire crystal. Solid case back. Case diameter: 43 mm. Case thickness: 10.92 mm. Round case shape. Water resistant at 100 meters / 330 feet. Functions: date, hour, minute, second, GMT. Casual watch style. Tissot Titanium GMT White Dial Men's Watch T0694394403100. Give your watch a whole new look with this dial. You will love it! I love this particular dial as it will coordinate with anything. As with all my custom dials, the quality matches the quality of a factory Rolex dial because it is an actual factory Rolex dial that is simply refinished with diamonds added custom. Model Number 16234. Custom Carolina Arctic Blue Mother of Pearl Diamond Dial. Year 1990 or newer. This bezel gives it the classic Rolex look. The dial is a beautiful blue custom diamond dial. Model Number: 16234. Model Number: 116200. I know it sounds confusing, but it's not. It's simple. The dial itself is original Rolex so it will fit exactly the way it should in this watch, and it has been refinished, and the materials used to refinish are genuine mother of pearl, genuine diamond, and genuine 18k gold. Give your watch a whole new look with this dial. You will love it. As with all my custom dials, the quality matches the quality of a factory Rolex dial because it is an actual factory Rolex dial that is simply refinished with diamonds added custom. Brand New Plastic Watch Crystal design to fit for Rolex Datejust 36mm The product is a high-quality aftermarket crystal, which is designed to fit exact measurements of your Rolex Datejust models. This crystal will fit models: 16014, 16013, 16003,16000, 16030, 16520, 16253. The crystal fits just like an original factory crystal, and also prevents moisture getting into your watch (waterproof). The crystal also includes a magnifier for the Date just like the original. The cyclops has a 2 1/2x zoom. This crystal will fit models: 16014, 16013, 16003,16000, 16030, 16520, 16253. Width: 30.50mm Date Magnifier: 2 1/2x SHIP WORLD-WIDE Attention Internation Buyers-First class & Priority Shipping cannot be tracked- Only Express Mail method shipping via USPS. Model Number: 116234. It is beautiful on a woman. I know it sounds confusing, but it's not. It's simple. Model: Datejust. Custom Diamond Dial in Tahitian Mother of Pearl. Vendor: Rolex. Case Material: Stainless Steel, Rolex uses 904L stainless steel superalloy for it's maximum resistance to corrosion and it is highly polishable. Stainless steel case with a stainless steel bracelet with white ceramic center links. Fixed stainless steel bezel with white ceramic inlay. Mother of pearl dial with silver-tone hands and stick hour markers. Reference Number 126300. Watch Model Rolex Datejust II. Box Rolex Box. Papers Rolex card, Watch manuals. Watch Dial White. We obtain our watches from reputable sources dealing directly with authorized dealers and distributors. Withall Custom Diamond Lugs, Bezel, Dial, and Band. Looks like the Pearlmaster 118389, 18956 or 81159 model. I LOVE that it is the midsize 36mm case. It's just a bigger watch than a ladies style, but still not too big. Multi-color band wristwatches are great for adding a hint of style to any outfit. With a unique band color, these watches are ideal choice for expressing your individual taste. Silver band watches are versatile timepieces, which you'll love wearing every day. With popular designs, these silver watches are great if you're looking for a trendy style. Yellow face wristwatches will add a pop of color to any outfit. With a unique face color, these yellow watches are excellent for a one-of-a-kind timepiece. Silver face watches are chic timepieces. These watches have popular styles to instantly elevated any ensemble. 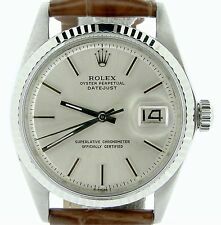 What are some of the most sought after rolex Datejust watches on ebay?